Evonik won a Leading Employer award and was named the best in the chemical industry. Evonik ranks 22nd in an overall assessment of over 70,000 companies. The sources used for the analysis such as employer rankings, certifications, awards or employee assessments include the categories of employee offerings and employee satisfaction, corporate social responsibility, diversity, and family-friendly working environment. You can find out more about Leading Employers here. The German Award for Online Communication honors the best digital communication services by companies in 15 different industries. Evonik received the award in the Chemicals & Pharma category for its #HumanChemistry employer branding campaign. You can find out more about the German Award for Online Communication (DPOK) here. 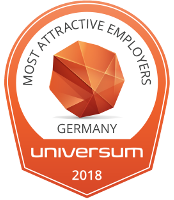 The latest Universum employer ranking puts Evonik in the top 3 of Germany’s most attractive chemical companies. Evonik thus ranked higher than many of its competitors. Universum is a global employer branding leader with over 25 years of experience. You can find out more about the Universum here. Fair companies are committed to recognized quality standards and verifiable rules in internships. 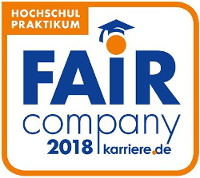 The Fair Company label is awarded each year for this responsible, transparent corporate culture. You can find out more about the Fair Company label here. Behind strong chemical products are strong employees: We show this in our employer corporate video for which we were shortlisted for the corporate video category. Instead of professional actors and speakers we turned our staff from all around the world into the protagonists of the video, which was translated into three languages. The German Award for Business Communication awards companies that stand out for extraordinary, targeted, effective business communication. Evonik received an award in the Special Award 2018 Employer Communication category for its social posting on the #HumanChemistry careers webpage. You can find out more about the German Award for Business Communication here. Every year, Trendence publishes the rankings of Germany’s 100 most attractive employers. Evonik made it to the top 10 in the chemicals & pharma sector for school students, university graduates, and young professionals. You can find out more about the Trendence ranking here. Evonik was shortlisted for the HR Excellence Award in 2017 for its new careers website. Every year, HR Excellence Awards are awarded to the most innovative HR management projects. You can find out more about the HR Excellence Award here. The Top Employers Institute included Evonik in its ranking of China’s 50 top employers in 2018. The Top Employers Institute certifies employers worldwide that demonstrate outstanding human resources management and strategy. You can find out more about Top Employers China here. Evonik’s Blair, Nebraska, site was recently awarded Outstanding Nebraska Business of the Year by the Nebraska Diplomats, the largest economic development organization in Nebraska. The Nebraska Diplomats form alliances with other Nebraska economic development organizations to promote the state’s productive business climate and its unique quality of life. You can find ou more about the Nebraska Diplomats here. Following the wake of destruction from catastrophic hurricanes during 2017, Evonik North America launched an online gift program with the American Red Cross so that employees could make financial contributions to disaster relief, along with a one-for-one matching amount from Evonik. Evonik has supported American Red Cross activities for more than a decade, but the results of the 2017 disaster relief campaign were extraordinary, totaling nearly $100,000. As a result, Evonik received the “Culture of Caring” award from the American Red Cross New Jersey during a special ceremony in April 2018.